Dubai, UAE, April 30, 2018: What is good for the body is good for the skin, and nothing packs a more powerful nutritional punch than superfoods. 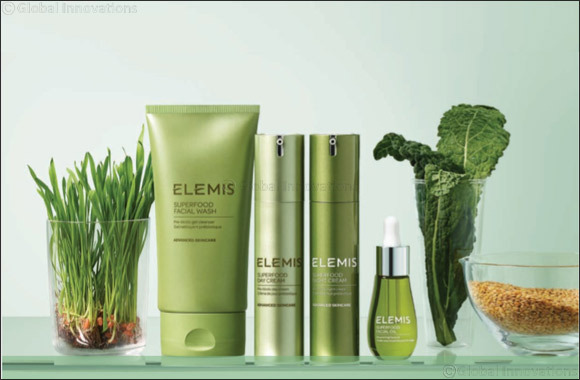 This is why ELEMIS has developed the new Superfood Skincare Range: a nutrient-dense, vegan-friendly collection, including Superfood Facial Wash, Day Cream,and Night Cream to join the best selling, award-winning Super food FacialOil. Feed your complexion from the outside in with the pure power of concentrated superfoods, for optimal skin health.This range beautifully blends the proven science and expertise behind every ELEMIS formula. The result? An outdoor-fresh glow that you simply can’t fake. Essential to these power-packed formulas are Super green and Super grain Complexes,richin anti-oxidants,omega fatty acids,vitamins and minerals to feed the skin with nourishment. The Superfood skin care range features a Pre-Biotic, designed to aid insupporting the good-for-you microflora on the skin’s surface, helping to balance and maintain the skin’s delicateecosystem. Created specifically for the wellness and health-conscious, the ELEMIS Superfood Skincare Range fits right in to a balanced lifestyle. Now, with a start-to-finish skin care regime,you can help your skin operate a top timal health with the nutrition it needs to appear fresher, healthier,and glowing. Massage this gel cleanser into skin for a penetrating clean that purges pollution, dirt,and excessse bum. Broccoli Seed, Avocado and Pumpkin Seed offer a balanced diet of active ingredients that help transform skin lacking vitality into a radiant complexion with an outdoor-fresh glow. Superfood Day Cream is rich in vitamins and anti oxidants and combined with a protective Pre-Biotic, which helps defend skin against environmental aggressors,for skin that looks and feels healthy. Lactob ionic Acid, which is known for its ability to smooth kin,instantly brightens the complexion. A blend of highly concentrated superfoods that deeply nourish and hydrate. Anti-oxidant and omega-rich Broccoli, Flax Seed and Daikon Radish feed the skin, helping to soften and smooth. Lightweight, non-greasy and easily absorbed, this oil will leave your skin balanced witha healthy,radiantglow.